The 'Selecta' feature allows Rx6x receivers to be made active or inactive from the Trandsmitter. For example, several locos can be brought in and out of service without touching them and operated with one Tx. This is done by associating each Rx with a position on an activating channel. Simply change the switch position to change which loco is active. Selecta is enabled by default on Rx60-22, Rx61-22, Rx63-22 and Rx102-22 receivers. These receivers simply require binding with Tx22 to enjoy this feature. Selecta can be enabled manually on other Rx6x receivers. The position of the activating channel is memorised during binding. The Rx responds to the Tx only when the activating channel is in that position. It ignores the Tx when the activating channel is in a different position. If the activating channel is in the correct position, the led on the Rx will come on solid and the Tx will have control. If the position is not correct, there will be a 2-flash and no settings on the Rx can be changed. As soon as a model is deselected, its settings are frozen. 1 seconds after the Selecta switch stops changing, the next model becomes active. The 1s period can be reduced. This allows some 'fumble' time during which the throttle needs to be positioned where you want it. If the motor needs to change speed, it can take up to 3s to blend into the new position. The activating channel will typically be a switch with up to 12 positions. One channel is normally dedicated for this purpose. Any channel can be used; Tx22 uses Channel 2 in this way. Each Selecta 'position' is about 7 'trim clicks' wide so the trim on a joystick channel can usually be used to select up to 5 models (the stick stays centered). 1-flash - scanning for Tx on startup. 2-flash - the activating switch is in the wrong position for this Rx. ON solid - all OK You have control. The normal and safe behaviour when a model is made inactive is for it to stop. When the model is something like a train on a continuous loop or you have external modules that require continuous control signals, the 'continue' option can keep everything running while you use the Tx to control another Rx. More details. Place the selector switch in the appropriate position for this model and Bind. The led will come on solid and you can operate the model. Enter programming mode and enable Selecta (5,1,2). Check that the Activating channel is correct; rebind if changed (5,2,x). Tx22 has a 12 position rotary switch which is intended for selecting locos. Many joystick transmitters have 2 or 3-position switches. These can be used to select models. Joysticks rotate potentiometers. 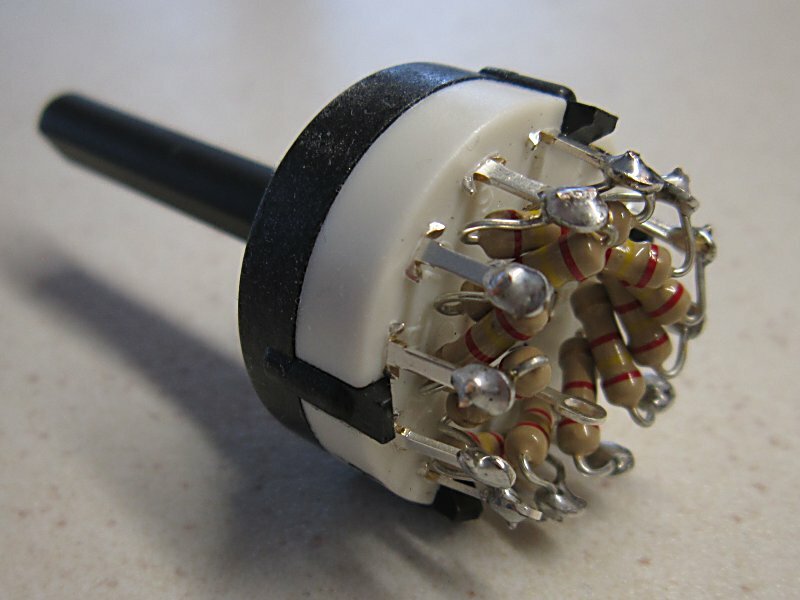 The pot on these proportional channels can be replaced with a series of resistors and a switch. This is described in more detail below. The pot in some transmitters does not use its full movement (the joystick mechanism restricts it). It may be necessary to measure the voltage range that the pot actually uses and use this spreadsheet to calculate resistor values. Use 100% throws. Note that resistor T1 is not needed with standard transmitters. A multi-position switch can controlled with Tx2; see the Tx22-Kit. More connection examples are shown below for 6 and 12 positions. Resistors R1 and H1 are the same value to center the range. R2..12 create even steps. T1 doubles the value of all the other resistors because Tx2 needs this. The default throws for Tx2 are 150%. Any analogue channel can be used except those intended for motor control in trains (these are affected by the Inertia feature). Tx21 has Ch2 available for use as a Selecta switch (150% values). Ch1, 4 or 7 can be used instead of Direction switches in Tx23 (150% values). The normal and safe behaviour when a model is made inactive is for the motor to stop. When the model is something like a train on a continuous loop or you have external modules that require continuous control signals, the 'continue' option can keep everything running while you use the Tx to control another Rx. If set to 'stop', all except servo outputs will stop as soon as the Rx is made inactive. Note that servo outputs always actively hold their last position. If set to 'continue', all outputs will hold the position set immediately before the Rx is made inactive. This allows a dynamic choice (ie: you can stop the model and it will stay stopped, or you can set to motor to continue running and that's what it will do). This option may be needed for external modules that prefer no disruption to the control signal when the Rx is 'inactive'. If Failsafe is set to a 'normal' 1-4 seconds, you can switch the Tx off for an Emergency Stop. If Failsafe is set to the 'sleep' time, this will not be effective and you will need to be prepared to activate the model to cut the motor.